With the 2016 NFL Draft set to get underway Thursday evening, it’s now time for me to release my final mock draft version for the Pittsburgh Steelers. As always, please know that this is the part of the draft process that I hate the most when it comes to producing content as I will be lucky to hit one correct pick. With that disclaimer out of the way, my goal, as usual, is to hit at least three picks. Additionally, of the 28 total players that I listed in this mock, my goal is for at least five to wind up being selected. Without further ado, here is my final Steelers mock draft for 2016. So why didn’t I go with Baylor defensive tackle Andrew Billings here? While I still haven’t completely ruled him out being the pick, after conducting a few mocks of the first round on my own, I wonder if he’ll indeed still be on the board come time for the Steelers selection. There are three teams that I think could potentially draft Billings in the first round and they are the Washington Redskins, Minnesota Vikings and Cincinnati Bengals. While I also considered Houston cornerback William Jackson III in this spot, like Billings, I think he’ll be off the board as well. Personally, I have Jackson as my No. 3 overall cornerback in this draft behind Jalen Ramsey and Vernon Hargreaves III. Due to my above assumptions, that leaves Joseph as the remaining logical selection for the Steelers. Like most of you, I am concerned about his knee injury but with that said, all signs point to him being able to contribute in some form or fashion during his rookie season. When healthy, he is by far the best safety in this year’s draft class, in my opinion. He is a very smart player who not only plays the run well, is very instinctive when it comes to pass coverage. With that said, Joseph needs to work on improving the angles that he takes at the NFL level. He can not only play inside the box, but deep as well in all types of coverages. Character wise, the former west Virginia team captain checks all of the boxes outside of an underage DUI he received a few years. I’m sure the Steelers have asked him about that during the multiple times they have talked to him. Not only did they attend his Joseph’s pro day, they also brought him in for a pre-draft visit. While Joseph isn’t likely to see much playing time in the Steelers defense until potentially later on in his rookie season, he should still be able to contribute heavily on special teams in the meantime with the focus on him being a starter in 2017. Let me start the explanation of this pick off by telling you that I really came close to putting Oklahoma wide receiver Sterling Shepard here. The only thing that stopped me is the fact that I think there’s a good chance he might be drafted in the top half of the second round. With that disclaimer out of the way, I think you all know how I feel about the Steelers drafting a defensive tackle this year who can not only play over the nose in the base 3-4, but also play sparingly as a pass-rusher in the team’s sub package defenses. Now, while Javon Hargrave is certainly a logical choice for the Steelers, it should be noted that the organization usually likes to shy away from FCS products. Hargrave, however, destroyed his competition while at South Carolina State and that should be expected if he expects a team like the Steelers to spends a second-round draft pick on him. Over the course of the last two seasons he recorded 104 total tackles, 46 tackles for loss and 29.5 sacks. Now, Hargrave will still have an adjustment period at the NFL level and especially when it comes to handling double-teams as he is more of a one-gap player who thrives on penetrating. Is round two one round too early for him? I certainly could understand that argument, however, if he were to slide to the third round, I doubt he would stay on the board very long. Should Hargrave ultimately wind up being picked by the Steelers, his selection will certainly be widely debated. Just the same, I can see him potentially winning the starting nose tackle job midway through his rookie season as he only has to overtake Daniel McCullers to do so. By season’s end, I can visualize him seeing some limited playing time as a pass rusher in the team’s sub package defenses. While the Steelers do need a lot of help on defense this year, I will be surprised if all three of their first three selections wind up being dedicated to that side of the football. Additionally, like it or not, the team could stand to use another wide receiver with Martavis Bryant being suspended for the entire 2016 season and Markus Wheaton entering the final year of his rookie contract. Now, while Braxton Miller is obviously a work in progress having only played one year at the wide receiver position in college after previously playing quarterback, I do like his upside and potential as an NFL slot receiver. He is an athletic playmaker in the open field and reportedly a very hard worker. If this pick smells like it’s being framed to sound just like the Steelers selection of Antwaan Randle El in the second round of the 2002 NFL Draft, it’s supposed to. Some might say that taking Miller in round three is one round too early and that’s certainly understandable. Look, the Steelers drafted running back Dri Archer in the third round a few years ago and I think most of you will agree that Miller has more potential than he had. Besides, you can’t have a Steelers draft without taking an Ohio State player, right? Should they ultimately draft Miller, wide receivers coach Richard Mann will have one full year to develop him with the hopes that he could ultimately be a contributor on offense in 2017. During his rookie season, Miller could potentially help out on special teams in addition to seeing a few snaps on offense in plays designed to get the ball two him in the open field. Also, as former quarterback, a trick play or two certainly wouldn’t be out of the question in 2016. Should miller wind up being drafted by another team, you can bet I will be monitoring his career very closely. While it’s a lazy narrative, Miller is a “football player” and as the old saying goes, you can never have too many of those. Make sure you read the rest of the mock before throwing your tomatoes at me as you might need more. By now, most of you are probably very angry at me because I have failed to address the cornerback position. I know I’m in the minority with this, but I have a feeling the Steelers feel comfortable with their current depth chart at the position. After all, not only did they draft two cornerbacks in the first four rounds last year, they also view one of those two picks, Senquez Golson, as a draft pick this year due to him missing his rookie season with a shoulder injury. With that said, they did lose two of their cornerbacks to free agency this offseason and as a result need to add more depth via the draft. So why did I choose Tavon Young? Well, during his Monday press conference general manager Kevin Colbert talked about past draft misses and how that was likely somewhat related to those players not having heart and smarts. The undersized Young as both, in my opinion, and of all of the mid to late-round cornerbacks that were brought in for pre-draft visits, the Temple product appears to be the most fearless tackler of the bunch. Young, who also reportedly had a good showing at this year’s Senior Bowl, put himself on the map this past season for his play against Notre Dame as he was asked to cover top-rated wide receiver Will Fuller. Due to him being vertically challenged, Young is probably best-suited to play inside at the nickel corner position at the NFL level. While he might never become anything more than a reserve player or spot starter, he figures to be a special teams asset due to his speed and willingness to stick his face in the fan. Young considers himself a student of the game and avid tape watcher. He was a team captain at Temple and that will also endear him to the Steelers. While the Steelers didn’t bring in many linebacker prospects for pre-draft visits this year, they did bring in Jatavis Brown, who recorded 345 total tackles, 41.5 tackles for loss and 18 sacks during his college career. Make no mistake that while fearless, Brown is a bit undersized. He is a speed player who functions well in space and from sideline to sideline. Brown would obviously be an inside linebacker candidate with the Steelers and he’ll need to work on getting off blocks and wading through trash at the NFL level. While some have Brown pegged as a possible fifth-round selection, I see him more as a late sixth-round prospect as he is very unpolished. With that said, he could potentially make an NFL roster as a special teams core player while he attempts to get stronger and learn how to properly play inside as a run and chase 3-4 linebacker. Even though the Steelers signed veteran free agent inside linebacker Steven Johnson during the offseason, they still could use more bodies at the position. They could do worse than Brown. I suspect the Steelers might take a late stab at an offensive lineman this year and particularly one with potential position flexibility. Being as Steelers offensive line coach Mike Munchak attended the South Carolina pro day, it’s obvious that he wanted to see Brandon Shell up-close. Shell played on both sides at South Carolina with 26 of his 34 starts coming at right tackle. While he’ll likely never be a starter at the NFL level, with some work, he might be able to serve as a reserve tackle. Additionally, Shell might have enough thickness to kick inside to guard. I could potentially see Shell, who is indeed related to Pro Football Hall of Famer Art Shell, possibly being the Steelers sixth-round selection. While several draft analysts have Joel Heath going undrafted, his measurables say he’s at least worth a seventh-round draft pick. In fact, Heath’s 115.4 pSPARQ score is right there with the 115.5 score that Mississippi State defensive lineman Chris Jones registered. Now, make no mistake, Heath certainly is still a work in progress and he needs a lot of solid coaching to reach his full potential. He was moved around quite a bit on the defensive line at Michigan State but should settle in as a 5-tech in a 3-4 defense. With that said, Heath should also be able to function as nickel defensive tackle. If Heath can be taught how to use those long arms and big hands of his better, it will certainly help his cause both against the run and as a pass rusher. He is a high-effort player who runs after the football consistently and that should endear him to defensive line coach John Mitchell. Heath reportedly has a great character and I will be shocked if he winds up going undrafted. For that matter, he might even wind up being drafted prior to the seventh round. If your judging him by his stats from last season, do keep in mind that Heath only played 46% of the total defensive snaps in 2015 and a lot of playing time was missed due to an ankle injury. He also only played 47 third down snaps in 2015. 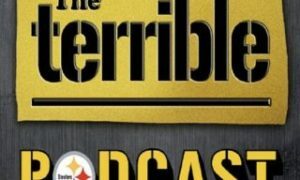 Summary: I feel like I have addressed all of the needs well in this mock as a whole and have chosen players who not only fit those needs, but ones the Steelers are likely to have some level of interest in. I fully expect to catch the most hell for the selection of Miller and I’ll certainly understand why. It’s a peculiar pick, but I feel as though I explained my reasoning for it. Additionally, I know several with take issue with me waiting until the fourth round to address the cornerback position. Not only that, I chose one of the shorter cornerbacks in this year’s draft class. I really wanted to address the outside linebacker position in this mock and while I didn’t, there’s a part of me that hopes the Steelers do in the first four rounds. As a whole, I see the Steelers drafting at least two offensive players and won’t be surprised if the final total winds up being three. I hope all of you respect the time and effort that went into this draft exercise that really is a losing proposition when you think about it. I hope to have the annual draft contest forms up for you to fill out later on this afternoon so please make sure you be on the lookout for them.